I'm finally home from my 5 day stay in Round Top, Texas, where the bi-annual antiques extravaganza takes place. I had never been so my friend Renee finally decided to check it out. 10,000 people from around the globe congregate in this small town twice a year to attend! We stayed at the beautiful Tillworth Retreat in Round Top, run by the charming Bernard and Marilyn Mendoza. This lovely Bed & Breakfast is surrounded by lush greenery, cows, fountains and pure peacefulness. We stayed in one their meticulously restored historic log buildings called the "Albert Suite." 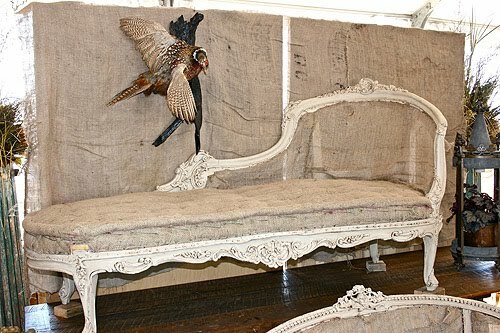 It was beautifully decorated with lovely antiques...so comfy! I lugged my camera around everywhere, and can you believe it? NEVER TOOK ONE PHOTO! I could kick myself for that, but this was a working trip, thus, fighting the elements; heat, wind, mud, gravel, bugs, etc. With the wind snapping at your face, I could hardly think of photos! 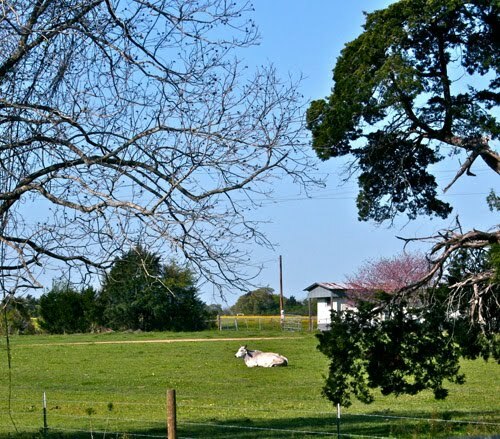 So, please visit Kellie's blog here to see some great captured moments of Round Top. Okay, so let me sum up our experience. Did we have fun? yes. Did we buy a lot of treasures? no. I need to share a couple of my observations with you. 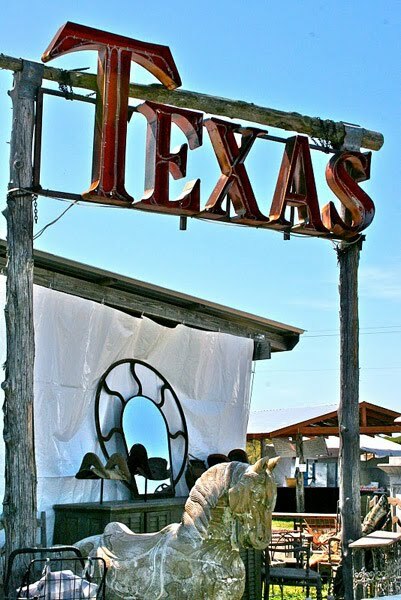 Round Top is miles of fields, tents and barns brimming with everything from old gas station signs to fine European antiques. Here is my problem. I noticed a huge percentage of antique reproductions. Yes, quite a large amount, and that scared me. Even though there were spectacular "real" antiques, I saw more reproductions than I've ever seen in my life. Any time you see an abundance of something, you need to question it. 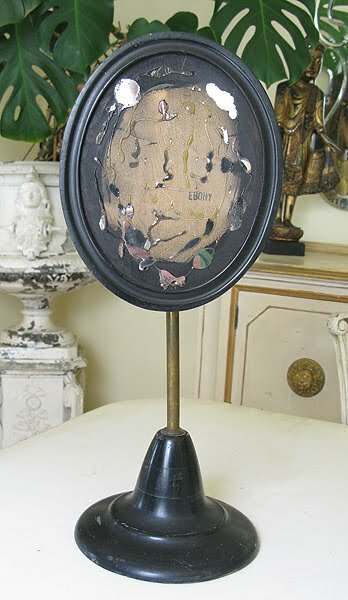 There were hundreds and hundreds of starburst mirrors, most of them great reproductions, but with "antique" prices. Some were real of course, but many of them were repros. The repros are done so well that even a seasoned antiques dealer can be duped. 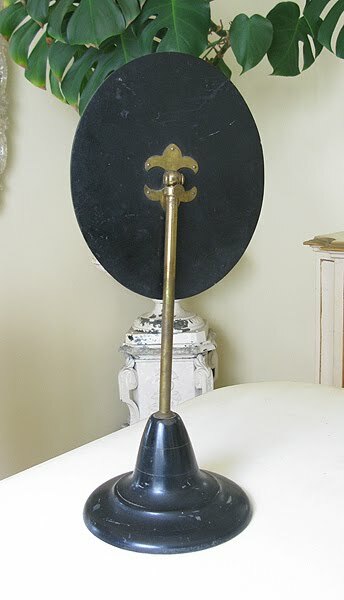 Well, I was duped by this 19th century French mirror that I purchased. It was not inexpensive. I packed it very carefully in my suitcase, but the mirror fell off. Had it not fallen off, I would never have noticed this "EBONY" stamp on the wood. REPRO! I've been selling antiques for 15 years, and once and awhile we all get burned. But this mirror looks over 100 years old. Even the felt on the bottom is old. The mirror, even chipped on the edges. How can this be? 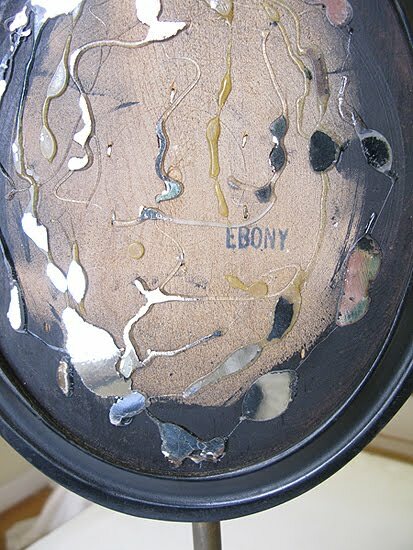 A 19th century European mirror would never been stamped "EBONY." In fact, there would be no stamp. And certainly if there was, it would be "NOIR" in French. 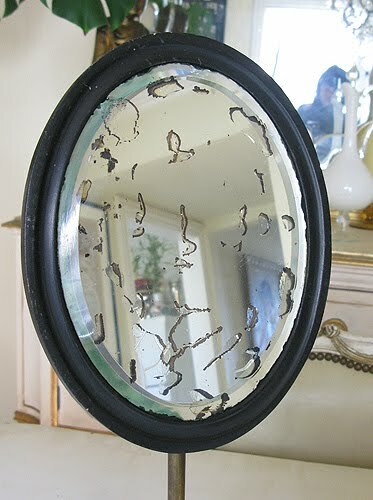 Someone out there is making frames, stamping them with the color of the paint, and placing old de-silvered mirrors in them. Scary, huh? And along with reproduction mirrors, I saw everything from repro French furniture and chandeliers, to French globes and apothecary jars. Advice: Buyer Beware. Just make sure you know your seller very well, or feel comfortable purchasing a reproduction at a reasonable price to get "the look" you want. AND, if you see an abundance of something, think carefully. It may be a reproduction. 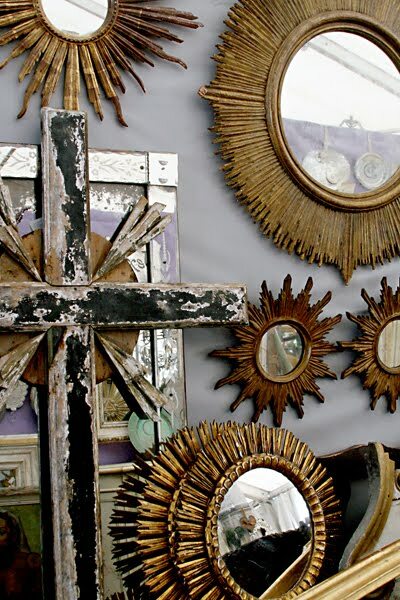 I don't want to bash any of the sellers at Round Top, as the folks in Texas couldn't have been lovelier, and I saw some of the most beautiful "real" antiques. We even enjoyed a Passover Seder with the owners of our Bed & Breakfast, Marilyn and Bernard. Who would have thought that in a town of 70 people, I would be having a Seder meal with strangers? That's Texas. Nothing but surprises. 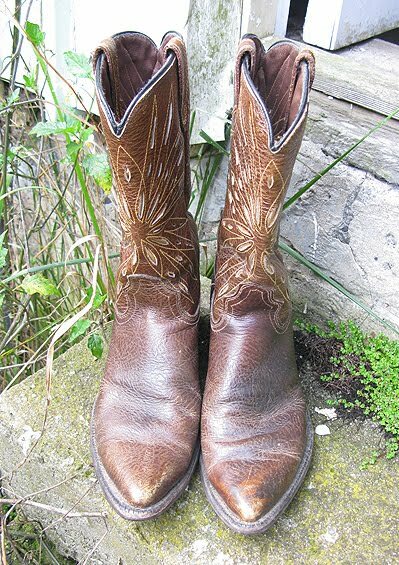 And finally, one of the highlights of my trip was this vintage pair of cowboy boots I purchased. Yes, my first pair! I love how aged they are, the hints of gold, and the great design. I'll always remember this wonderful trip; meeting great people, the delicious pies at Aunt Lou's, having dinner at a Shell gas station (only two restaurants in Round Top), gazing at green pastures with cows...Texas is fun y'all! So sorry to hear about your mirror, just crazy! Although I live in Houston I've only made it to Round Top once. It was way too crowded and everything was way too expensive for me. i have some great candles + they have a crepe stand that is out of control!!! It is so hard to buy these days, you always have to be suspicious, it is not a good way to shop. Even us dealers get taken once in awhile, and gosh that mirror looks authentic. Love the boots, great find and have fun wearing them. 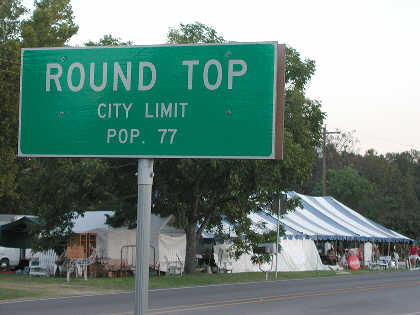 I have been wanting to go to Round Top. I use to live near Brimfield in Mass. and use to go to that 3 times a year, now that is one sale you should check out. I was just in Round Top last Thursday...I wonder if our paths crossed. I actually shopped in Warrenton a couple of miles up the road and found lots of small things. I plan to do a post over my trip next week. It's unfortunate that you traveled so far and didn't find a load of treasures, but the boots are nice. 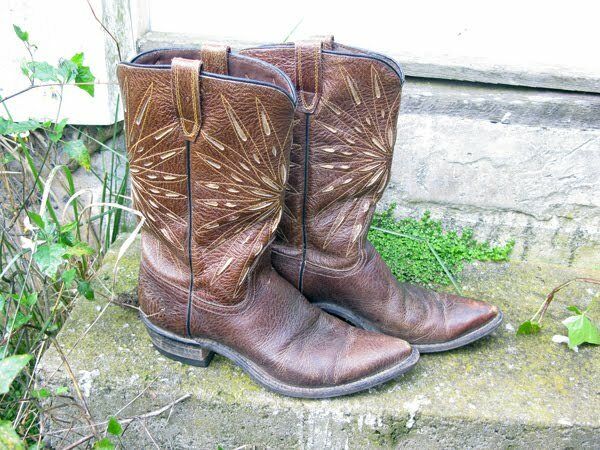 I have lived in Texas my whole life and have never owned a pair of cowgirl boots! I hope you had fun anyway. last time I was at marburger -- that guy that has all that italian gilt candlesticks etc. and I said - this is all reproduction. and he got so indignant and said - it's all antique! yeah sure. and i'm mother teresa. you are so right, whenever you see a lot of anything - it's all fake. We have seen many repros come into the antique jewelry store that I work at...people thought they had purchased the real deal, to find out it was a contemporary piece made to look older. It is good for bloggers like us to let readers know and help educate! I love your boots! Fabulous!! I always love reading your posts about repros. I look more closely now when I buy. 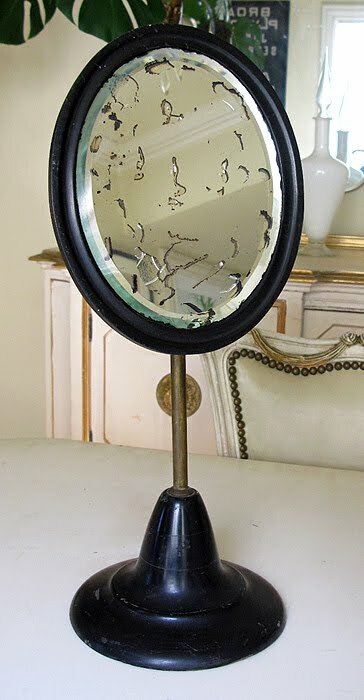 Even though your mirror is a sham, it's still beautiful. Thanks so much for sharing your trip with us! I love to see the world through your eyes, it's always more glimmering and more bright!!! PS I went to LACMA the other day to see the Renoir exhibit and we stopped in to see the Koons and contemp. art. I saw the Gold Michael Jackson with his litle Bubbles that Lisa included in her post. I couldn't help but think of you!!! ps. thanks for the mention here! so sweet of you!! I think we could all post about our "mistaken identity" pieces we have purchased. When someone is putting that much energy into faking it, the least they could do is erase the color! Can't wait to hear the details. Now are you going to go get that puppy? So sorry about the mirror, Lynn - but the boots balance the disappointment, aren't they? If you like reading about antiques and repros (in a light "mystery" genre), try Gash' "Lovejoy" novels. Lots of brow-raising info, let alone cute British slang.